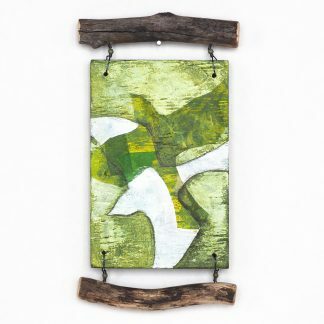 Small meditative mixed media wall hanging made from a painted and collaged reclaimed plywood panel. Calm white and pale blue contrast with three black leaf skeletons. 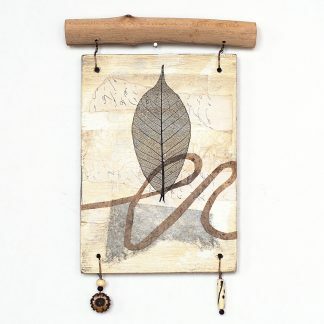 Driftwood pieces are laced on with steel wire and black and white glass beads. The wooden panel is 5″ x 5″ (12.7 cm x 12.7 cm), total size of the piece is 8 1/8″ tall x 8″ (20.6 cm x 20.3) inches wide.